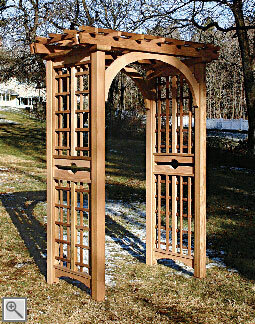 This pergola type arbor, with double rafters and graceful top arches, is a perfect complement to our Moon Gate. 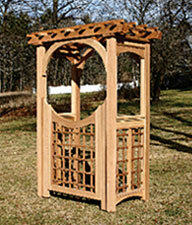 The combination of several strong design details makes this arbor a striking choice for your entryway. This structure is available with either full lattice side panels or with open-framed upper side panels and a latticed lower section. 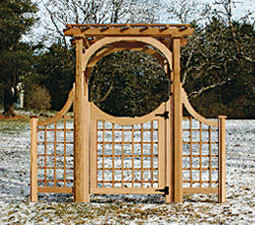 Shown here with the Moon Gate and the Curved Top Extensions, this arbor can be used with any of our gate and extension styles referenced in the Arbor Gates and Extensions section.